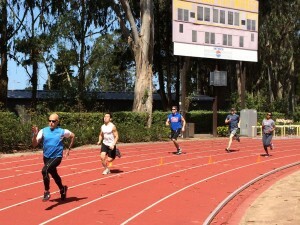 The team practice returned to San Francisco State University track after the fundraiser last Sunday. The drills and workouts were familiar to our eyes, but our muscles may have not gotten used to those yet. But that’s when Coach Mark comes in and provides us with correction and reinforcement. Great to have someone who can keep sharp eyes on us. The same grouping as two weeks ago with sprinters and hurdlers/jumpers/mid-distance. The idea is that we can repeat the similar exercise during the week so that you won’t be hurting on every Sunday. I know it’s easier said than done… Anyhow, the workouts are posted in our Track workouts page. These drills and workouts are programmed to make us stronger and faster. Even if you are not a track runner, these exercise will benefit you and help you become faster. If you are looking to shorten your PR on 5K, 10K, half marathon or marathon, track workouts are essential and our programs can get you there. Come join us. The more, the merrier! There were no announcements today but that didn’t mean there were updates. Sorry about that. Here are updates. Great turn out at Rock ‘n’ Roll half marathon beer garden last Sunday. Total of 20 people volunteered their precious Sunday morning hours for the Club. A huge thank-you goes to everyone. There were moments we were almost running out of cold beer to give way, but let’s say the thrill made it more fun. The organizer LOVED us and we look forward to working with them on other opportunities in the future. 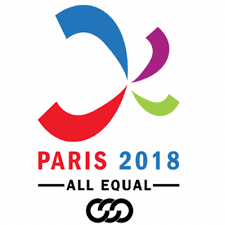 Pride Track & Field Meet online registration is open! This makes the 7th year for us to bring the friendliest track and field meet to the national, regional and local athletes. For details, please visit Pride Track & Field website at http://pridemeet.org. Uniforms – We are trying to get sample uniforms from the vendor. Those who requested to try them on, please stay tuned for future updates. Application for athletic scholarships instruction is available online to those who are going to Gay Games 9 in Cleveland + Akron. Giants LGBT night at AT&T Park on Thursday, June 26. Tickets are available online at their special event page.